Owners Welcome You to Their Home Away from Home: Oh, the Views! Put on the fire and relax while you enjoy a good book or put on a movie. 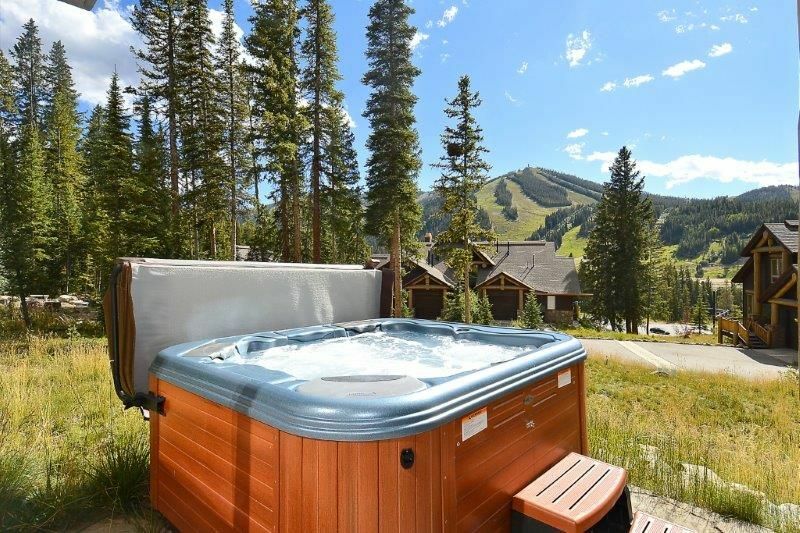 You will love the bubbly private hot tub and soaking in the beautiful views of the mountains and the ski slopes. Families with small children love to find this home fully equipped with a pack 'n' play and rocking chair. Lakota Mountain Lodge 106 can be your perfect home away from home in Winter Park. Sleeping Arrangements: king bed in master, queen in second bedroom, and a twin over full (new mattress) bunk bed on the bottom level. There's also a queen pullout bed in the living room and a pack 'n' play. Sleeps up to 9. Location: Old Town; 1/2 mile from Village at Winter Park Resort. Two miles to downtown Winter Park. It is a 50 yard walk from Lakota Mountain Lodge properties to the free shuttle pick up spot. Winter Park Lodging Company - Inspiring People to Experience Their Next Adventure. Our Mission Statement: Provide a custom, stress-free experience for every type of explorer, by offering high-end vacation homes, exceptional customer service, and sharing our passion for mountain living. The Winter Park Lodging Company Difference 24/7 Local Help: Book with confidence knowing that the rates, images and details published on this property are 100% accurate. We are conveniently headquartered in Winter Park, this provides us with a local advantage to take care of any issue or need that may arise during your stay, 24/7. If any questions, needs or concerns arise just call us and we will be there at your door to make it right. Keyless Lock: This home is equipped with a Smart Lock, allowing easy, secure access to your property at check-in and throughout your stay. There's no need to check in at a separate location! What's Included: Every home is stocked with all your household essentials, high quality sheets and towels, and a starter kit of Aveda bathroom products, and an ample supply of laundry detergent, trash bags, dish soap, tissues, etc. We're Following the Rules: This vacation rental is professionally managed and follows all local & state tax rules. Your reservation total includes all applicable taxes, cleaning fee, and Accidental Property Damage Protection. We thoroughly enjoyed our stay here. The views from the living area were beautiful! It was also a great location to the slopes and the Lift pick-up. We also enjoyed the privacy of the hot tub. The only complaint we had was being notified by email of hot tub maintenance, which was perfectly fine during our stay, but the maintenance crew happily let themselves in and downstairs to the hot tub without any notice - no knock on the door, no doorbell ring, no “hello, is anyone home.” This was a little disturbing as I was in the townhouse alone with my 8 month old daughter. Otherwise, we had a great stay and will likely revisit soon. Oh dear...that is embarrassing! So sorry Shanda that that happened to you. We are going to give the hot tub crew "a talkin' to" to be sure that never happens again. Our sincere apologies as we take our guests' privacy very seriously and this is your private place for the entire length of your stay. We will be reaching out to you and make this right! Condo was very comfortable for our group of six people. Very clean, well stocked, easy access to the mountain and short commute into town. Could have been a 5 star review but parking was an unexpected challenge. A full size truck cannot park in attached garage and outside parking was difficult. Thank you Michael. Those driveways that they designed for the Lakota Mountain Lodge town homes are surely on the small size. They do provide overflow parking at the main entrance to the Lakota neighborhood in case you ever need to utilize that. We are pleased that overall the property suited your needs. We enjoyed our time at the property. It was comfortable and the hot tub was great after a day on the mountain. Wonderful! We are so pleased you enjoyed your stay with us. Please let us know when we can host you again Phil. Beautiful views. Great TV. Nice master bed. You need a ledge in shower for soap, shampoo, etc. The current plastic thing doesn’t work. Need better skillets and utensils. Replace these. The lighting in master bath is too weak. Nice cool water from fridge dispenser. Nice heated floors. Thanks for those suggestions Beverly. We'll get on some options for the shower and updating the kitchen skillet and utensils. We will also look into getting some more light into the Master Bath too. We do hope to get to host you again. Beautiful, comfortable and an excellent location! That's terrific! Thanks for staying with us and we do hope to host you again. Exceeding our expectations! Beautiful property, amenties, clean, and fabulous location.